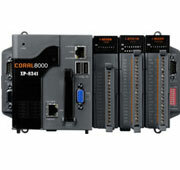 The CORAL-8341-16 solution consists of the CORAL unit with a 3 slot backplane for plug-in I/O Cards and a SCADA Package which will handle up to 16 I/O tags. The software also includes 2 independent logfiles, 64 User Defined Analog Channels (for setpoints etc), 64 User Defined Digitals Channels (for virtual switches etc) and 64 Derived Calculator Channels for data manipulation. A single driver is included while various additional drivers are available as options. The 3 Slot unit is ideal for applications that require some local Data Acquisition. It can also be used with other devices or distributed data acquisition (e.g. I-7000 range) so as to keep sensor cabling runs as short as possible. This could include use of ZigBee Converters or I/O units to provide a wireless network. NOTE: This is just an example combination. CORAL is fully scalable and can be configured for specific requirements. Data can be stored on the units built-in 4Gb Flash disk (ideal for environments with a high level of vibration). Optionally the data can be stored to a CF Card or USB Flash stick. Ventilated housing allows the unit to operate between -25 and +75'C. Available with 3 or 7 slot backplane to accept plug-in cards for local sensors. Orchestrator PID (Proportional Integral Derivative) Controller Software for maintaining a Measurement at a preset value. Orchestrator SCADA software is an advanced real time information system that can be profitably used in business, technical and engineering applications.